Welcome to JollyDaze 4 & me! A short six week meme to carry us through the end of the year. A meme for us to enjoy the holidays with. We'd love to have you join us! Click here for more info. After the kids open their stockings, we have a big breakfast, and do the dishes, much to the kids' frustration, LoL. 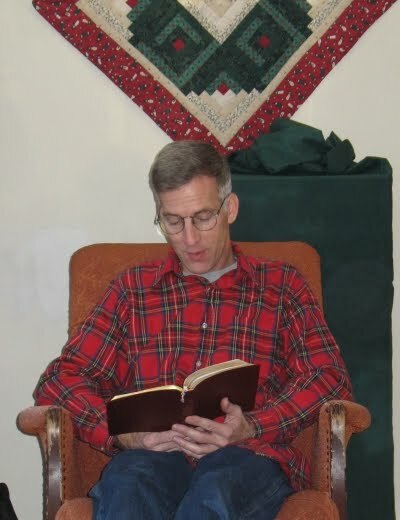 A tradition my father started years ago is to read the Luke 2 account of the birth of Jesus. It's one of those things that's near and dear to us and something we've continued on with even when Mom and Dad aren't with us for Christmas. After Dad or Jim reads Luke 2 and we talk about it some, then comes the gifts. One at a time, taking turns so we can enjoy and savor each gift given and received. Christmas is a family time we treasure. So tell me, what's your favorite family Christmas tradition? If you're joining us for the JollyDaze 4 u & me meme by posting on your blog this week about Christmas, be sure to add your name and the link to that particular post in the linky gadget here. On deck for next week: Christmas Decorations... your favorites and what they mean to you... how to make a particular Christmas decoration... decorations you remember... or anything Christmas. Click here for our post idea starter schedule. Awww! Your photos are perfect for illustrating the memories. How wonderful for you and your family! Good fun and good memories! We've done our share of camouflaging gifts at our house, too! Especially the times when someone is getting the one and only thing they really truly wanted--and we don't want them to assume! Yep, yep on the camouflaging here too. Another little trick my hub enjoys doing it to tape up every last fold and possible opening so getting those presents is a real challenge. The kids hate when Dad wraps gifts! Had the gift camouflage thing going when the kids were younger. I remember one Christmas I put beans in every box. The kids were sure every time that this one was the puzzle. 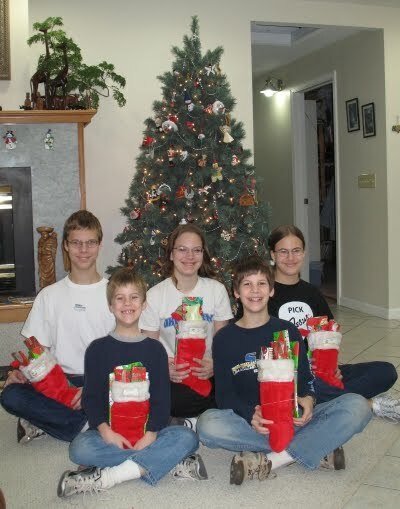 They didn't get a puzzle that year! Ha! 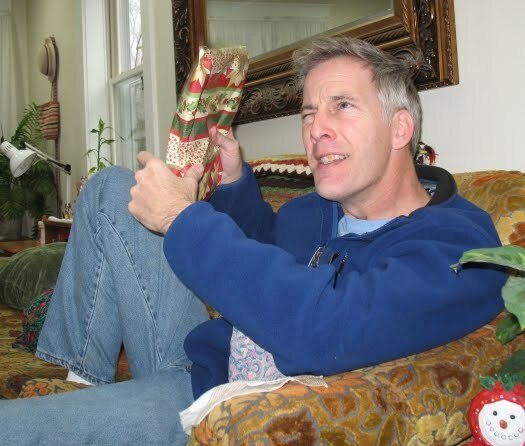 LOVE that pic of Jim shaking his present. PRECIOUS! Great traditions. Patty, thanks for sharing these treasured Christmas memories and traditions. The reading from Luke is one of my favorite parts of Christmas. Hugs!